In no-holds-barred remarks at a celebratory dinner Thursday night, the South Carolina senator and unsuccessful presidential candidate said the GOP has lost all semblance of sanity and predicted the party will suffer irrevocable losses in November if it backs Trump. Graham said the GOP has its best chance in years to win as Democrats are likely to nominate Hillary Clinton, who has been damaged by questions about her trustworthiness. But his party is about to blow it, he said. “The most dishonest person in America is a woman, who’s about to become president. How could that be? 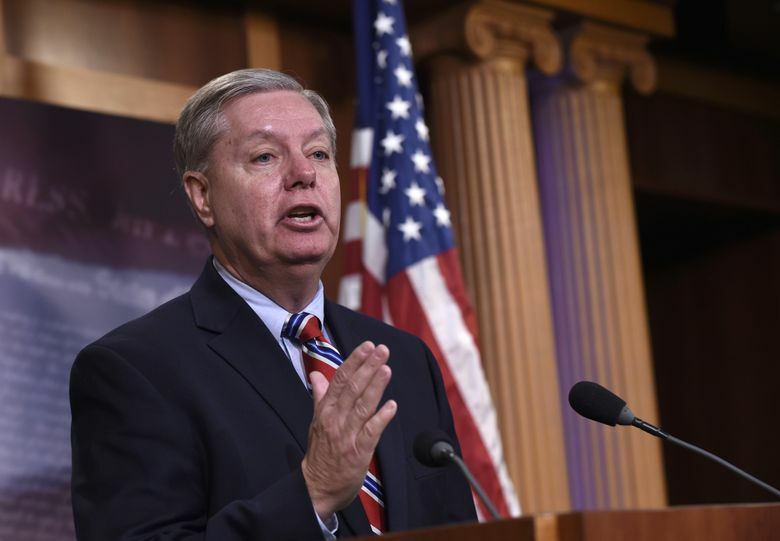 My party has gone batshit crazy,” Graham said. The plain-spoken Graham has repeatedly engaged in name-calling with Trump. Earlier Thursday, Graham called the GOP front-runner a “nut job” and insisted his party would go down like the Titanic if it backed the billionaire businessman. Hours later, at the Washington Press Club Foundation’s annual congressional dinner, attended by more than 750 lawmakers, journalists and congressional aides, Graham made a scathing attack on the GOP and several of his former presidential rivals. The dinner traditionally is a joke-filled affair with lawmakers poking fun at each other. “I know exactly when Ted’s going to drop out of the race. March 12th. That’s Canadian week at Myrtle Beach, when all of our Canadian friends get 10 percent off,” he said. Graham called 44-year-old Florida Sen. Marco Rubio “boy wonder” and suggested he was politically malleable. “I’m not saying he would change his positions, but he would change his positions,” said Graham, who worked with Rubio on a sweeping immigration bill on which the presidential candidate has backtracked. In closing, Graham declared himself the Dr. Jack Kevorkian of the GOP presidential campaign, referring to the euthanasia activist who died in 2011. Graham’s own presidential bid faltered, and he had to drop out. He endorsed Jeb Bush, who subsequently quit. Graham then pulled out a white baseball cap emblazoned with Trump’s “Make America Great Again” slogan and endorsed the New Yorker. “I endorse Donald Trump and hope the Graham magic still exists,” he said.